Is it normal for female larva to be quite small? 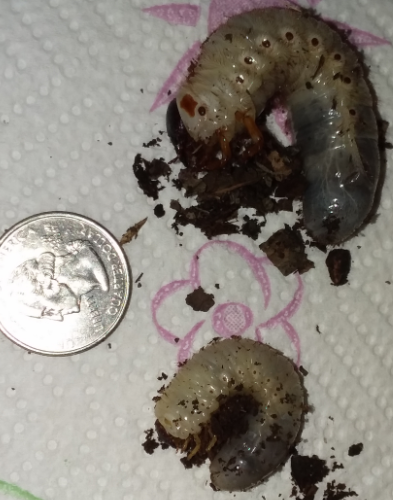 One of my larva from a trio I bought in October appears to be half the size of my other two grubs. I know females are smaller, but I worry. Forgive me as this is my first time raising Eastern Hercules. I tried offering the smallest one dry dog food, but even after a whole month, they haven't touched it so I removed it because I was concerned about the mold sapping all the nutrients from the substrate. Would it be a good idea to put them into plain compost with wood chunks? Right now they're all in a mix of things with leaves and wood in compost, but I don't know if they would benefit from oak leaves at all. Edit: I know fermented oak is best but I'm out of that for the moment. I was fermenting oak pellets/dust for them but now it's gotten too cold to continue with that, hence the plain compost situation until it warms up again and it's not freezing my bucket. I'm not sure if it would ferment indoors or how bad the smell would be... so input on an indoor bucket would be nice. Your little lady isn't necessarily small, she's just a molt behind. She's just taking her time. Both grubs are full of food so you're doing great. Peter has oak sub in stock on Bugs In Cyberspace if you're worried about their food situation. Thank you! Others are free to weigh in more though. Glad to help. Even with the same conditions, some grubs just lag behind a bit. If they're cold, that will slow them down as well. You can tell she's a molt behind the other one - her head capsule is much smaller compared to the larger grub. Aaaah okay. I thought it was smaller because she's female, but that also makes sense. Some of my ox beetles are lagging in the same way, but they also hatched later. I think my hercules were all from the same batch, as I think I got Peter's last three listed on the website and they were fairly large when I got them. My ox beetles were from eggs from last year. I wish there was some safe way to keep them warm, but I'm afraid to use lamps constantly in this house. It was very warm here for a while and then suddenly it got below freezing and has stayed that way for a week. The huge temp fluctuations we've had since last year have got me worried that it's messed with them somehow. Females are tend to be smaller, but not sure if that actually is a female from the picture provided. D. tityus can take an year plus to three years to actually emerge to adult beetles. Each specimen, disregarding whether it is male or female, can take an year plus to three years or more to become adults. If there is any local garden and hardware stores available as well as Walmart, Lowe's, or Home Depot, then try find an organic potting mix. It is good alternative for a fermented oak substrate. Make sure your potting mix does not have any small centipedes earthworms, as it sometimes have in winter and colder seasons. I reared more than just couple D. tityus for several years now okay even with the organic potting mix (soil) commercially available from stores. There were three particular brands I used in past, but I can't remember any but one, which was Miracle-Gro. Its design has changed a lot, but try look for ones with vegetable images and orange colored bag. If not available in such look, just buy something that says "organic potting mix."